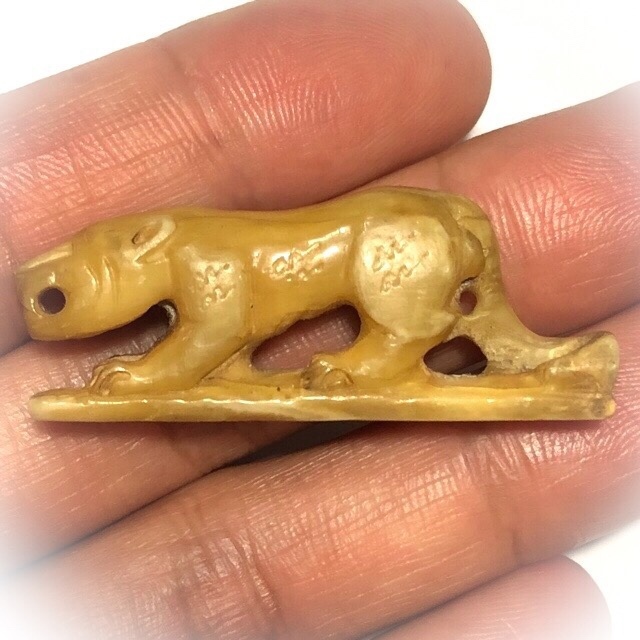 A very rare hand carved amulet in Nuea Nga with authenticity certificate, from the great Master of Wicha Bia Gae Olden Days of the Nakorn Pathom Province Luang Phu Bun, of Wat Klang Bang Gaew. 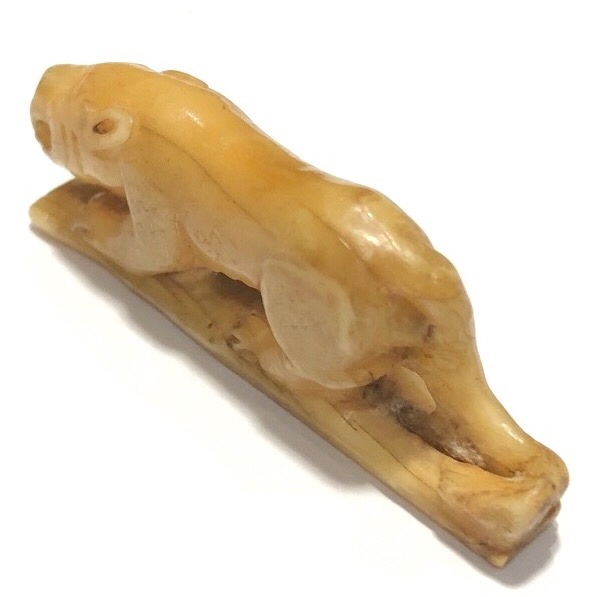 This exhibit is in extremely pristine condition, and shows the true qualities of ageing on its patina, to reveal an authentic model of the Sua Nga Gae carved antique ivory-carved amulet of Luang Phu Bun, with hand inscriptions. 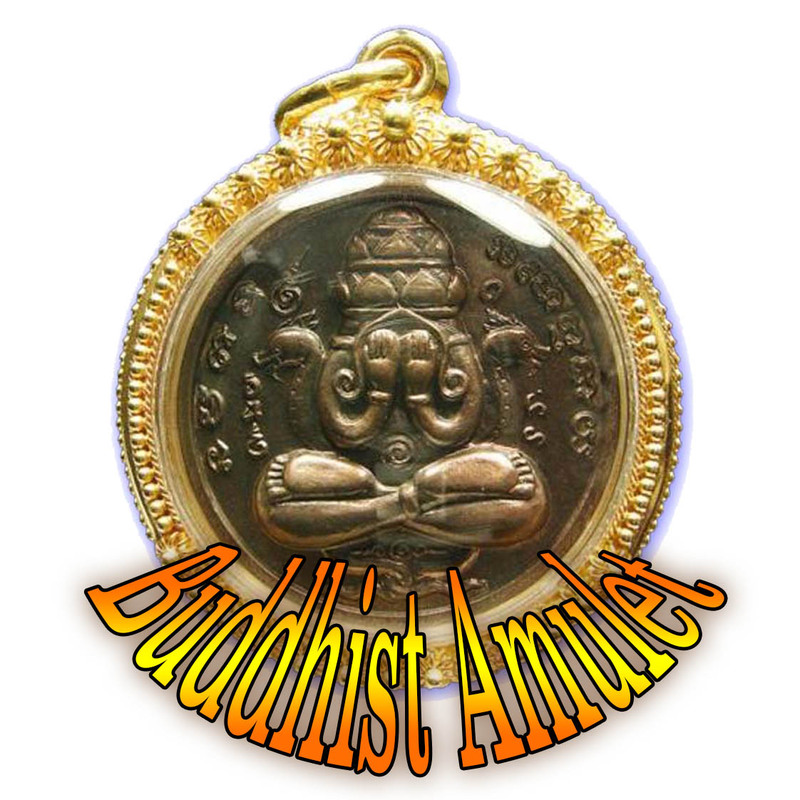 This amulet comes with free EMS Shipping Included in the price, with the options of waterproof, or solid gold custom waterproof casing as additional options. 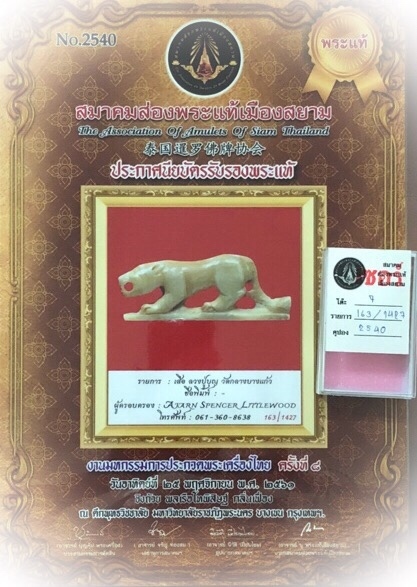 The amulet comes with its A4 sized plasticized Certificate of Authenticity issued by the Samakom Song Pra Tae Mueang Siam Amulet Society, during their 8th official meeting of 2018 (2561 BE). 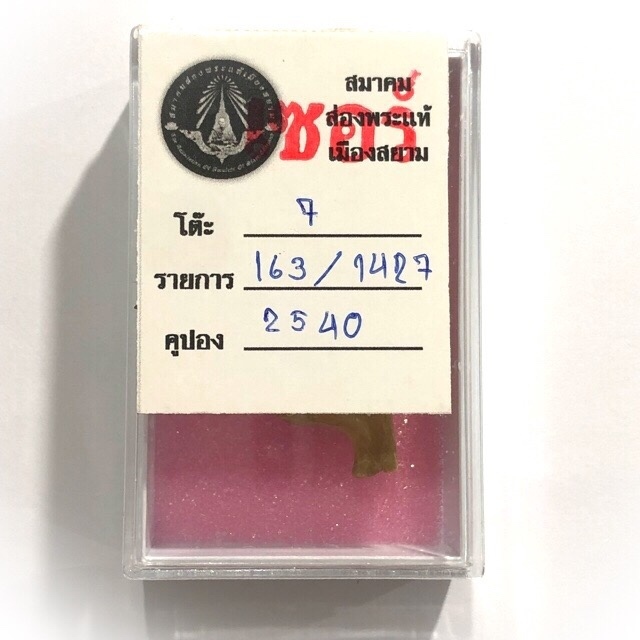 Below; Authenticity Certificate Suea Nga Gae LP Bun Wat Klang Bang Gaew - A Centenarian Amulet of Immense Value for the Sacred Powerful Blessings of the Great LP Bun, its Historical Importance, and Rarity as an Ancient Amulet of Master-Class Status, as well as for being a masterpiece of antique hand carved artisanry, in a substance that is no longer to be found used in the making of modern amulets, due to the ban on ivory, which only permits antiques. 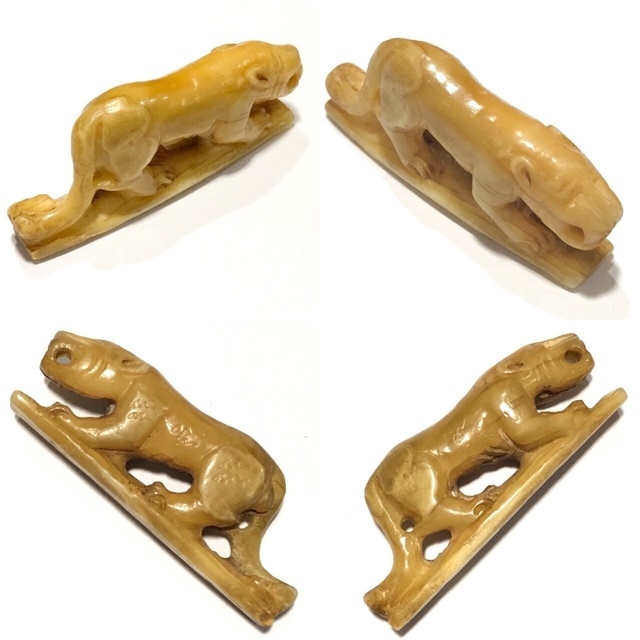 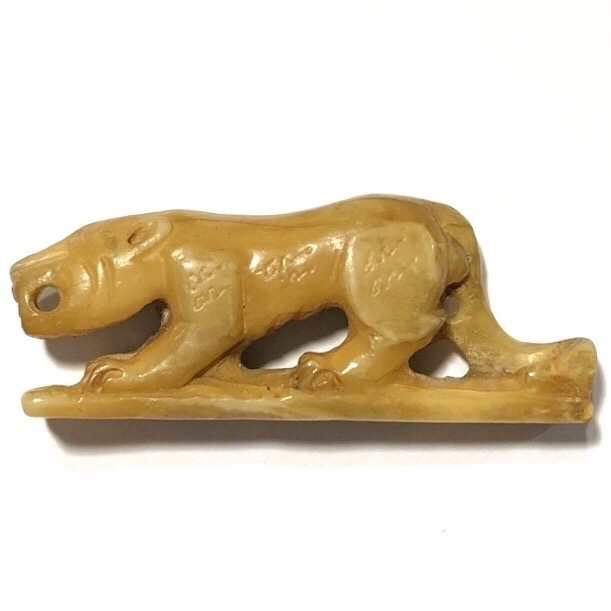 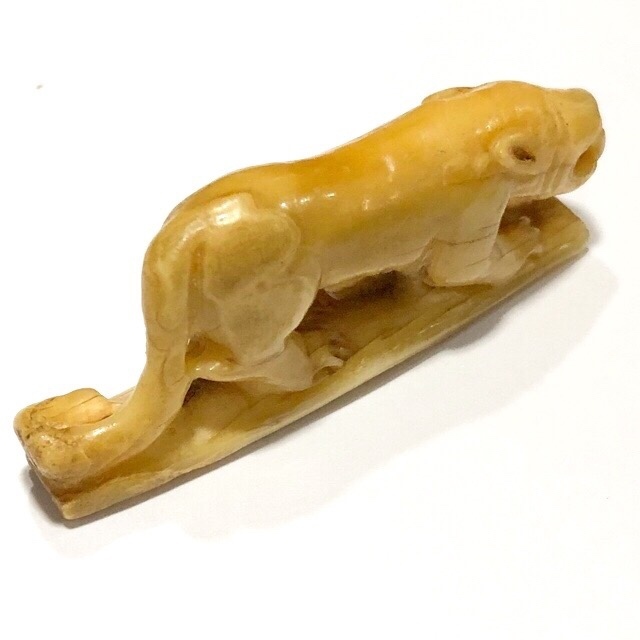 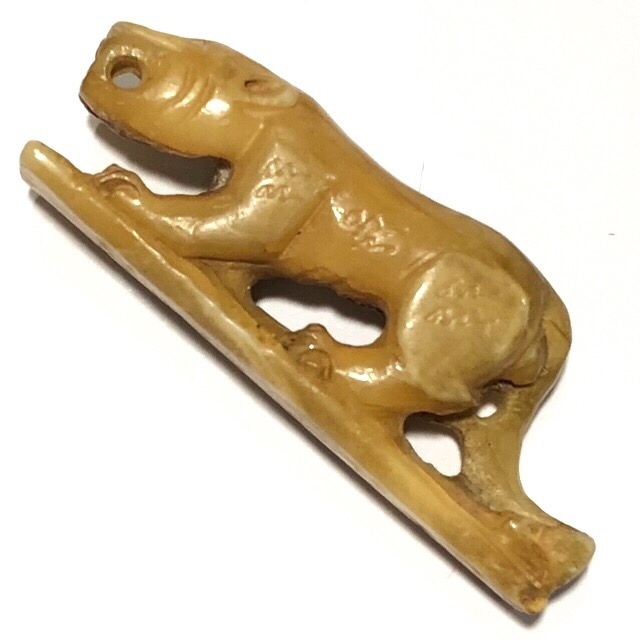 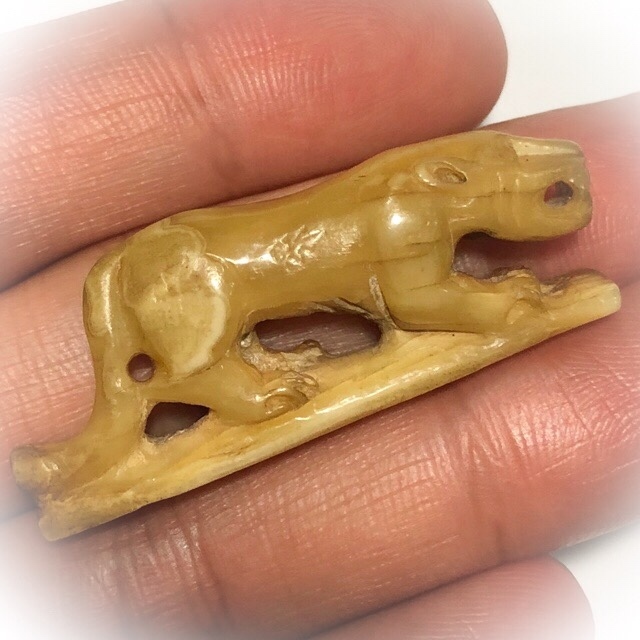 The amulet is made from carved Ivory, and is carved in the image of a tiger crouching ready to pounce upon its prey, which represents various aspects of Maha Amnaj Commanding Power, Invincibility, Chai Chana Victory Bringing Magic, Serm Yos Status Increase, Easy Living and Maha Pokasap Wealth Attraction. 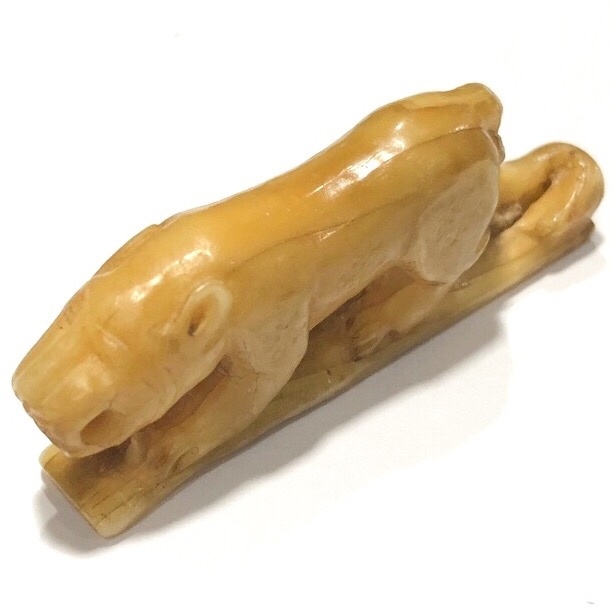 The tiger itself, especially when carved from Ivory, is naturally imbued with the Sorcerous Powers of Maha Amnaj (commanding power and influence), Serm Yos Status Increase for positions of command, and opportunities of promotion, and Metta Mahaniyom Mercy Charm to lull your Subjects and Charm them into Obedience. 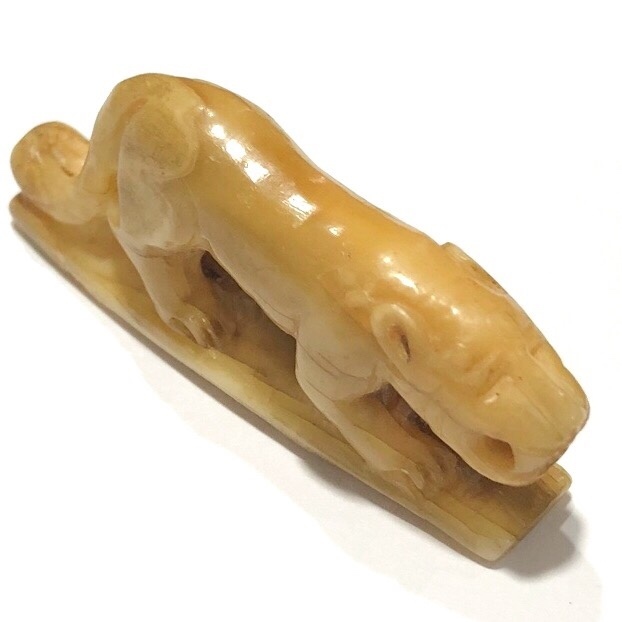 Maha Pokasap treasure Accumulation and Cornucopia of Requisites is also Imbued. 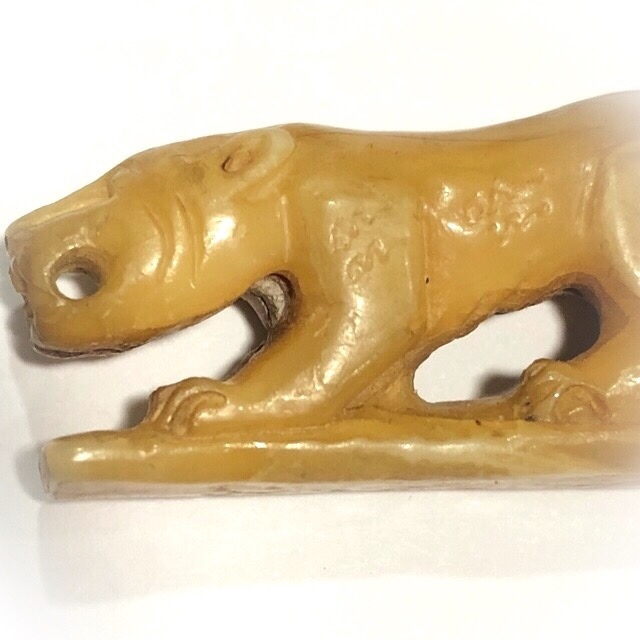 This is an extremely Rare Ancient Amulet of the Pra Niyom Master-Class of Thai Buddhist Amulets. 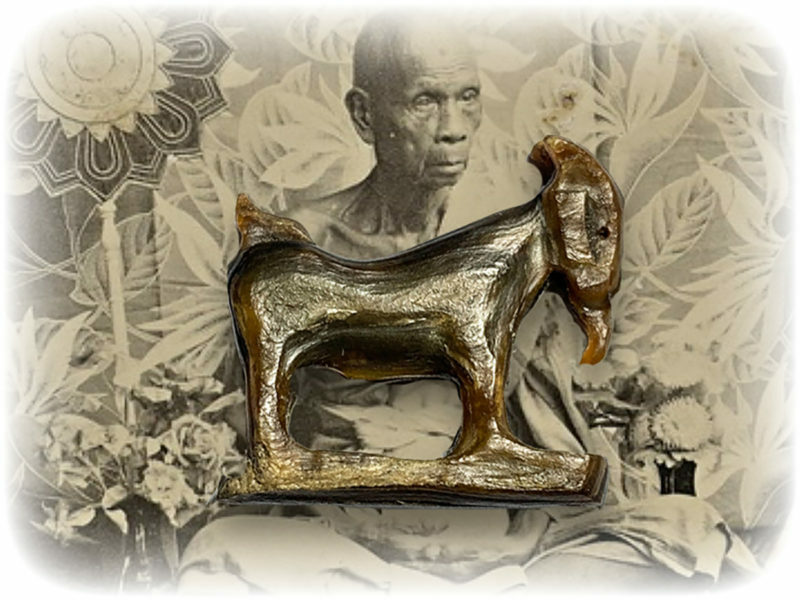 Luang Phu Bun is one of the Top Master Guru Monks of Thai Buddhist History in both Patipata (Dhamma Practice) as well as for his Magical Prowess in Amulet making, Puttasart, and Saiyasart (Occult Sorcery and Buddha Magic). 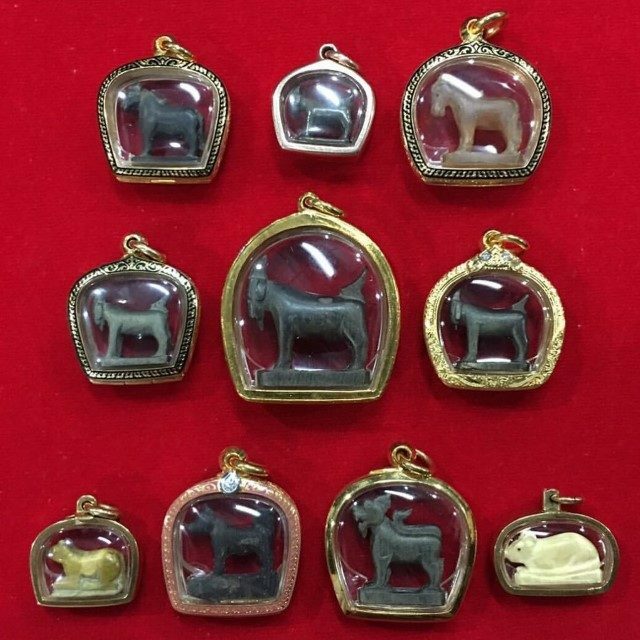 The amulets of Luang Phu Bun are famous for their immense Klaew Klaad and Metta Mahaniyom Powers and their Power of 'Serm Duang' (improve fate and destiny). 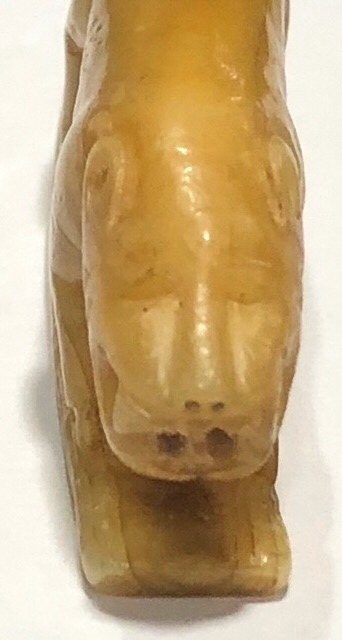 His amulets grace the pages of almost every famous catalog and amulet magazine in the High End Collector Publications, and are amongst the highest priced ranging from many hundreds of dollars for the most commonly found amulets, to hundreds of thousands of dollars for his rarest amulets. 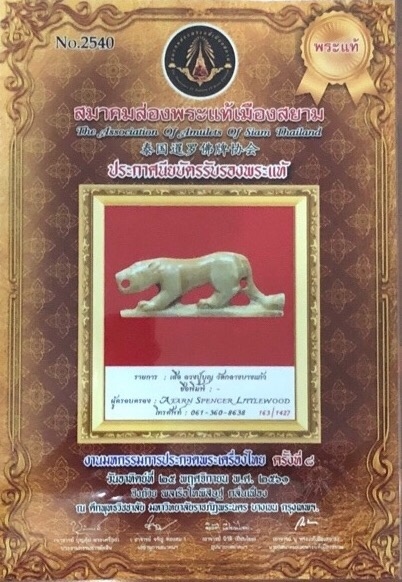 Luang Phu Bun was a close friend and accomplice in Wicha with the Great Somdej Pra Sangkarach (Pae) of Wat Sutat fame, whose amulets belong to the priceless treasures category and are only to be found in the possession of millionaires and high ranking persons of state importance, and a few lucky extreme collectors and devotees who have kept them throughout the generations, or inherited them as heirlooms from their family members. 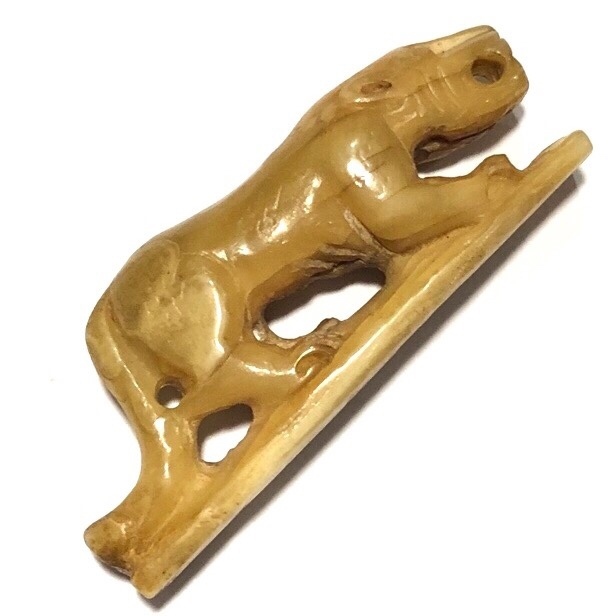 Almost anybody who owns such an amulet will be hard pressed to part with it in any circumstances. 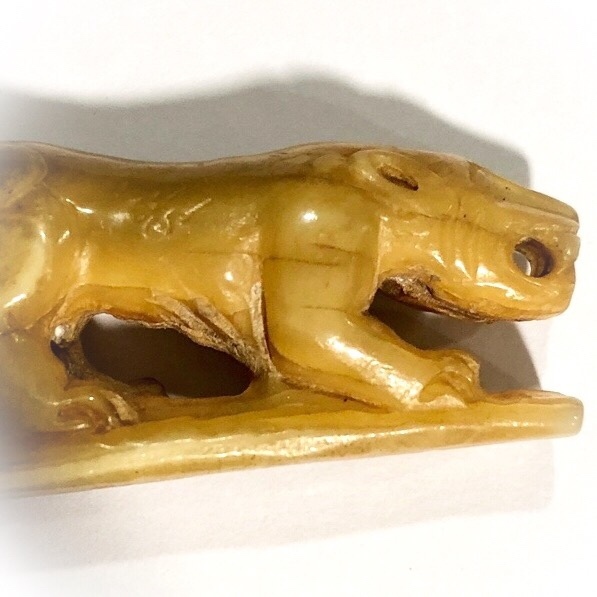 Below; The tail and mouth have orifices which can be used to thread strong but thin cord through, for those who prefer the olden days method of not encsing the amulet, instead, wearing the amulet against the skin. 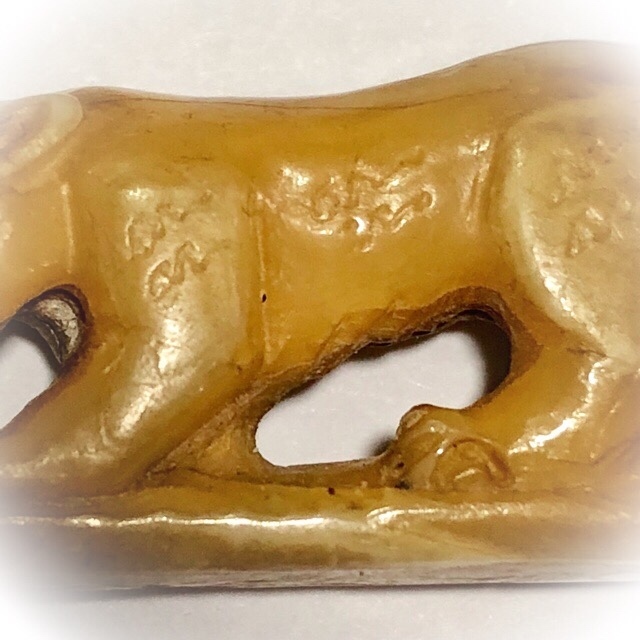 Khom Agkhara Inscriptions are visible on the side of the tiger amulet of LP Bun. 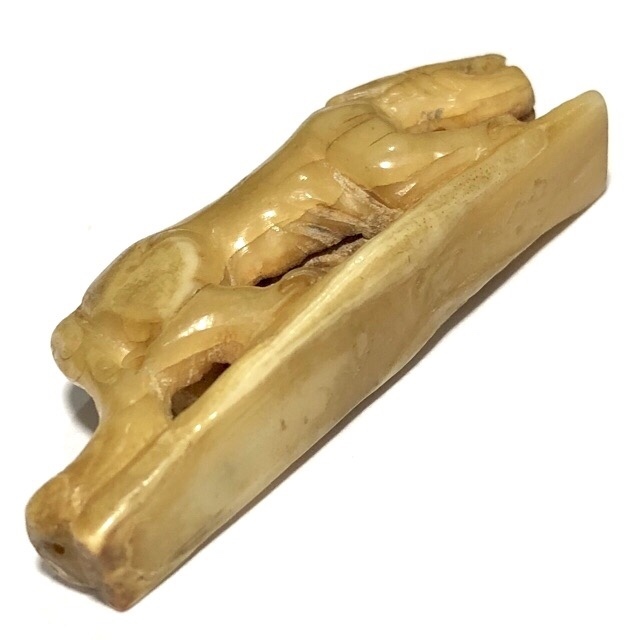 Luang Phu Bun was extremely famed for his Wicha of making Ya Wasana Jinda Manee. 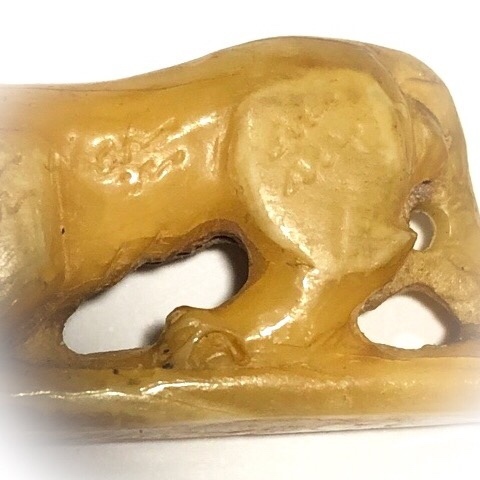 This Wicha was developed by Luang Phu from an Ancient Teaching through his Kroo Ba Ajarn, and has since his making the Muan Sarn famously powerful, has been inherited as a Wicha of Muan Sarn powder making for the amulets of the Wat Klang Bang Gaew lineage throughout the ages from Luang Phu Bun, to Luang Por Perm, to Pra Ajarn Bai, to Luang Phu Juea, and now the present holder of Luang Phu's now ancient Wicha, Luang Por Kong (Sanya) at Wat Klang Bang Gaew. 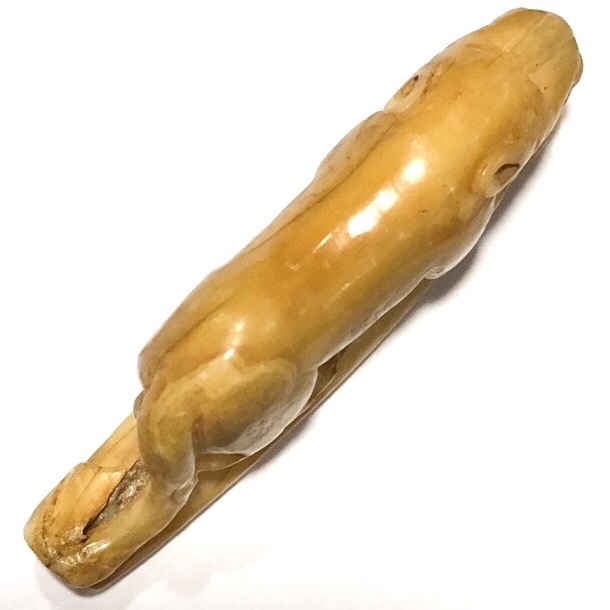 The Bia Gae of Luang Phu Bun is considered the most famous and difficult to find of all Bia Gae that are of Master Class status. 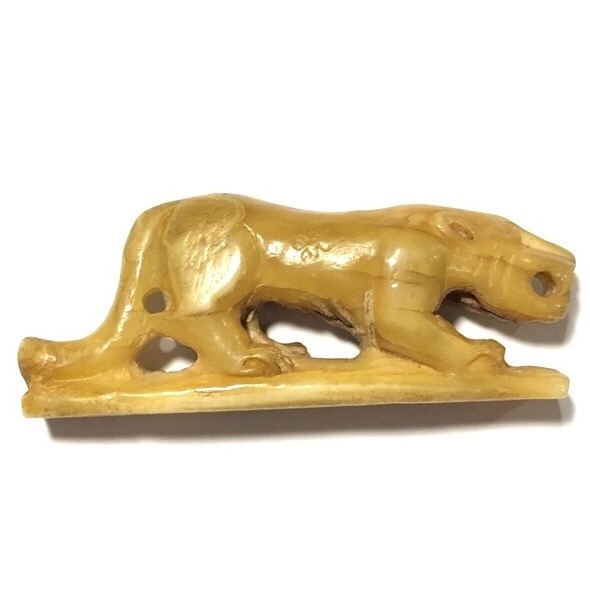 All following Masters of Luang Phu Bun's temple have become famous Bia Gae Masters, and continue to rise in procession in line and following after those now immensely unaffordable Bia Gae from Luang Phu Bun. 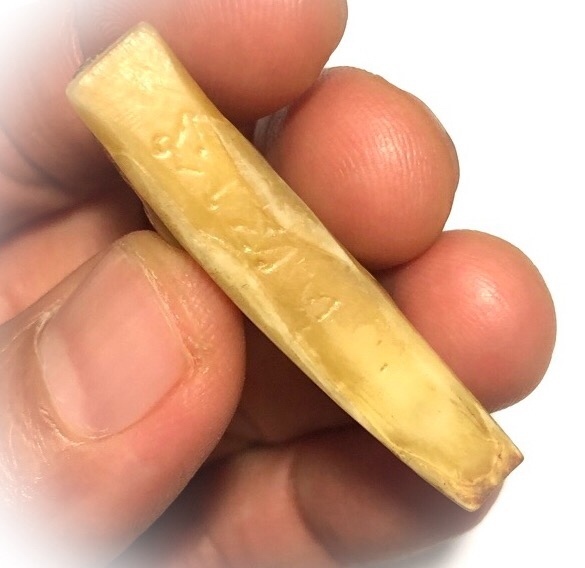 The famous Pong Ya Wasana Jinda Manee, and Pong Khamin Sek Muan Sarn Powders of Luang Phu Bun (also known as 'Pra Ya Horm'), carry legendary status for their immensely powerful magical properties. 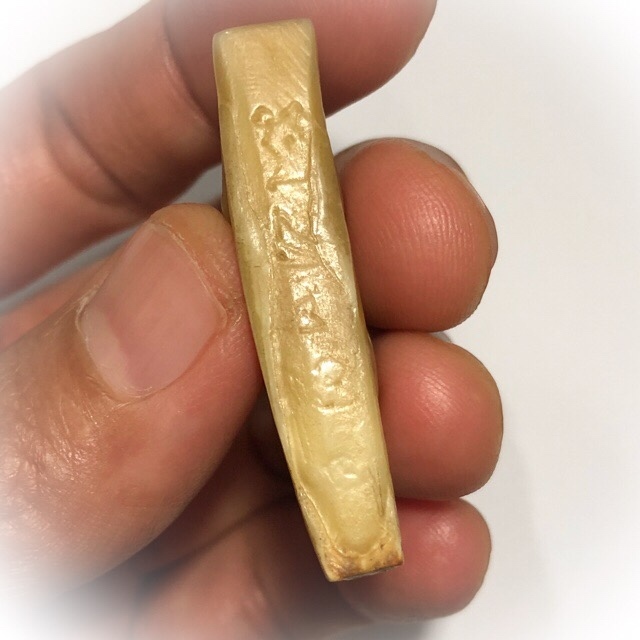 These are two very Sacred Powders within the Dtamra, with Pong Khamin Sek having a pungent aroma, with Powers of Protection and Wealth Increase, and the legendary Pong Ya Wasana Jinda Manee having an aromatic Sacred Powder, which uses of course the famous 'Ya Wasana ('Wasana' meaning Lucky Fortunes). 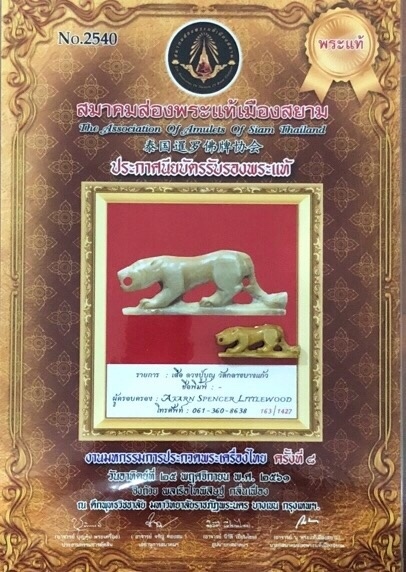 Pong Ya Wasana, and Pong Khamin Sek are the most famous Muan Sarn powders of Luang Phu Bun, and have become his Legendary 'Dtamra' (Traditonal Legend of Inheritance Wicha). 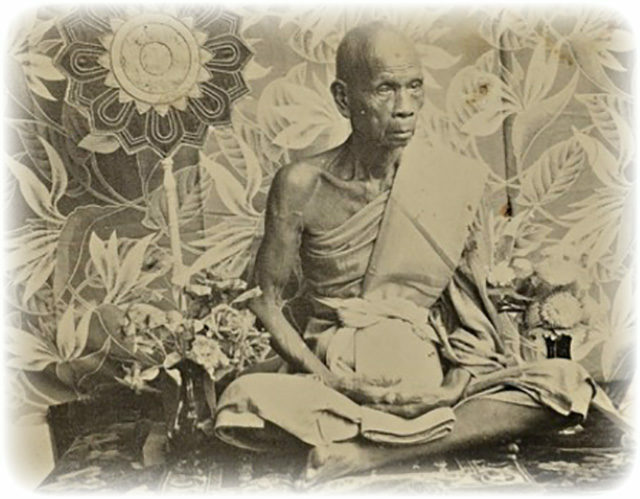 For the sake of lineage magic preservation, and continued equal respect to all following lineage masters of Wat Klang Bang Gaew, It must be noted, that despite the fame of his world famous predecessors at Wat Klang Bang Gaew, LP Bun, LP Perm, Ajarn Bai, and Lp Juea, the present Wicha Holder LP Kong Sanya of Wat Klang Bang Gaew, now holds a Wicha that has been passed through a long lineage of already Great and Famous Guru Masters. 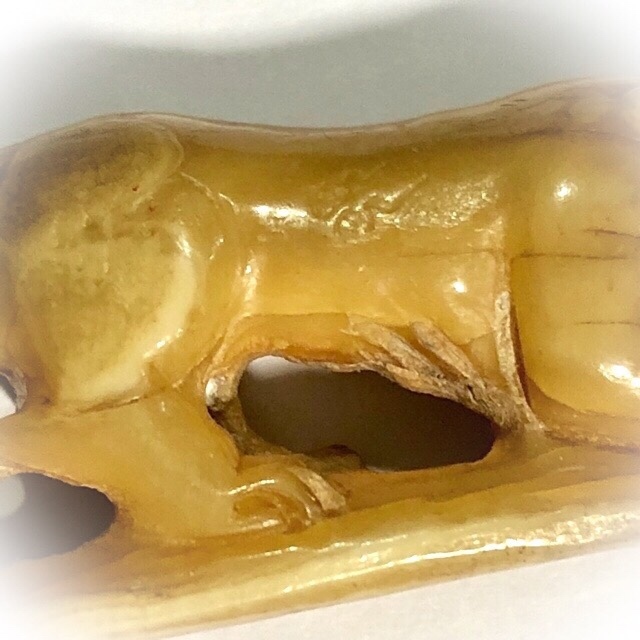 All Masters inherited this Wicha from the Great Kroo Ba Ajarn Luang Phu Bun, and who have all passed away in sequence after their long lives and trajectory. 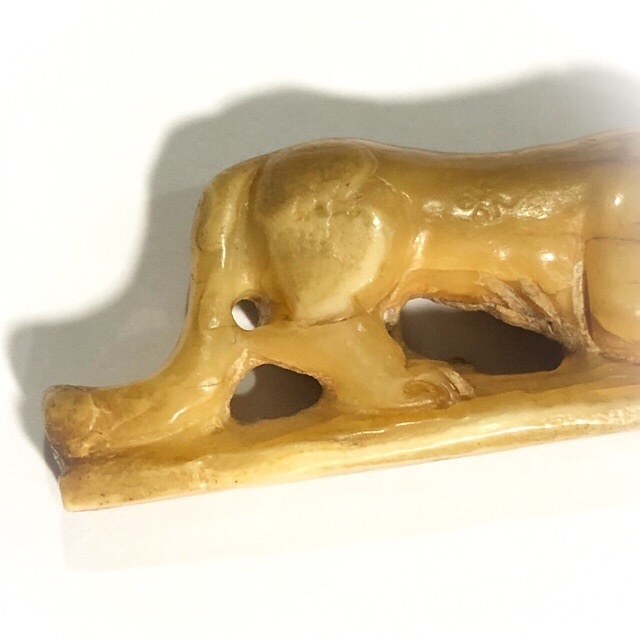 We are thus gazing avidcly at an amulet of a True Olden Days Master, who is already 4 -5 generations the predecessor of the current Wicha holder and Sentinel of the Wicha, making his amulets truly worthy of the title 'Ancient Amulet'. 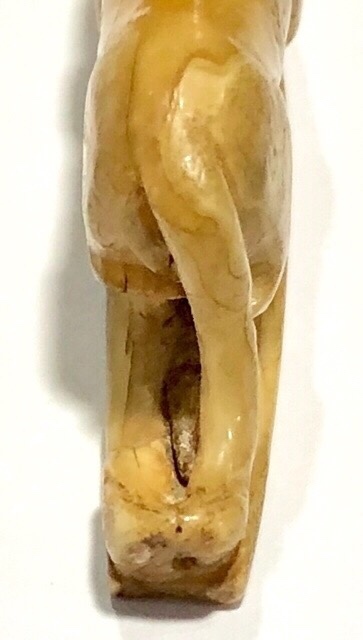 Below; Luang Phu Bun, of Wat Klang Bang Gaew.